The Four Sacred Mountains as an Extension of Mt. Taishan is part of the Tentative list of China in order to qualify for inclusion in the World Heritage List. The Five Sacred Mountains should actually be the Five Great Mountains of the sacred mountains in China. They are one of the goals any hiker has in China. Additionally to the already listed Mount Tai at the east coast and Mount Song nearby Dengfeng (read: Shaolin temple) and the separately listed as a tentative inscription Mount Hua near Xi'an, it also includes the not-so-well known 2 Heng mountains. As both are pronounced the same way people tend to call them Nanyue and Beiyue for North and South peaks. The northern one is usually done by a tour from Datong. It is easy to climb but you may need to double check with your tour guide that there is enough time to climb it. I found this the least pretties of all hikes. The southern one is easily reached from Hengyang which in turn is reached from Changsha by express train. The beginning of southern Hengshan is actually really nice but the climb up is only possible along the paved road as they try to ensure you buy a bus ticket extra as well as the cable car. 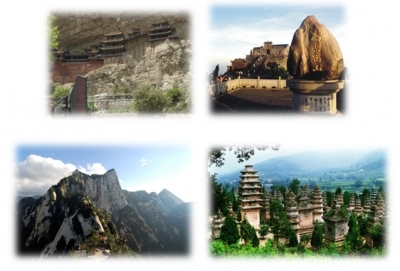 Overall the five mountains are pilgrimage sites that should be protected. Honestly the inscription should directly be for all five because Mount Tai doesn't have any special place in the set. I mainly enjoyed these for nature and getting a good workout. Personally I'll recommend Heng Shan (North Scared Mountain) of Shanxi province, because it's the least famous therefore least crowded one of four.